Welcome to the "evil" part of "the lesser of two evils." Donald Trump was never the conservative ideologue many of us wanted in 2016, but he was the guy we needed in 2016 - the one thing standing between us and the very real risk of splitting the country apart that was a Hillary Clinton presidency. So, as The Donald jumps in the canoe with Chuck Schumer – who is laughing at him hysterically right now – we're experiencing the downside of playing a sub-par hand, and we're experiencing it good and hard. The Never Trumpers, who by and large agree with the Smarmy Dope and the Elderly Establishment Ninja Turtle about rewarding the world’s oldest kids for breaking the law, are ecstatic because the most important thing for them is stamping out the GOP insurgency that brought Trump to power and imperils their sinecures inside Conservative, Inc. They are babbling about "betrayal" as if we’re surprised that Trump would do what he essentially hinted he would do all along – sadly, Trump always accepted the sob story policy premise underlying DACA. So, though the haters like to personalize it, it's not so much that Trump is changing his position, because he’s always telegraphed that this was his position, but that he's being so stupid as to let Chuck Schumer make a fool out of him. He and Nancy Pelosi have dinner with him, then walk out and basically disrespected him in public in a way sure to turn his base against him. It was actually a brilliant move on the Dems’ part, in a volcano-lair supervillain kind of way. And for some reason Trump is just taking it. Maybe he really thinks Americans are dying for liberalism disguised as bipartisan compromise. Until now, he has had a pretty good political sense. He beat Felonia von Pantsuit, despite all the overwhelming odds stacked against her in the form of opposition from the media, women, other progressives, and Russians, among the dozens of other culprits responsible for her defeat. But this Amnesty, Jr., move? It’s just stupid. Is Trump really so wimpy as to let Chuckie channel Wimpy and actually buy into the Democrat con man’s "Give me amnesty now and I will gladly pay you back, with all sorts of unspecified border security stuff, Tuesday" scam? It kind of looks like he is – how can Trump not see that Tuesday will never, ever come? To carry the cartoon metaphor forward, Charlie Brown’s tried to kick that football before, and it always gets pulled away, and now he’s lying over there in traction with multiple popped discs. Lesson One for every Republican, which every Republican seems incapable of learning, is to not be Charlie Brown. Mr. President, don’t be Charlie Brown, or the guy who lent Wimpy some burger money, or the latest Republican to negotiate with Chuck Schumer and think he’s made a great deal even though he ends up coming home wearing a barrel. Remember Little Marco Rubio? 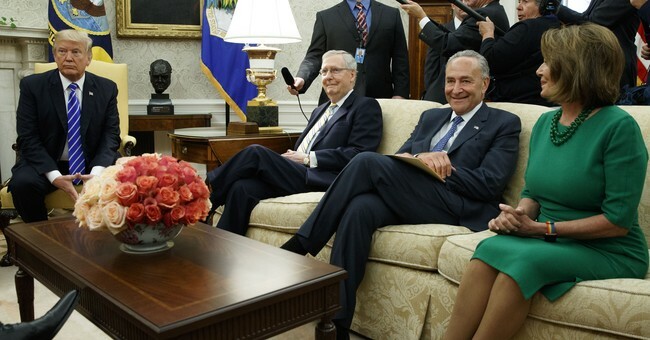 He got in bed with Chuck Schumer on immigration and in the morning he found that Chuck had left and that his car keys, wallet and political future were gone too. Mr. President, don’t be Marco Rubio, who incidentally is also laughing at you right now. They are all laughing at you right now. And you’re just taking it, like a punk. I’m embarrassed for you – you weren’t my first choice, or second, but over time I thought I saw some steel in that spine. Are you going to just let yourself be a laughingstock? And of course the GOPe will be no help. It won’t stop this. Its leadership desperately wants amnesty and doesn't want increased border security because those corporate donors have got to have their serfs. The pseudo-right component of the bipartisan cartel will be only too happy to deliver, using Democrat votes, while actual conservatives are left cut out and fuming. It's the same sucker play George H.W. Bush fell for when he went back on his "Read my lips" pledge. Democrats offer a gullible Republican some magic beans and get him to split his base apart. Read my lips, Mr. President: How you handle this mess will determine whether or not you are a one-term wonder. This is a low energy move, and if you fall for it you'll be remembered as a fool – a single-term fool. You don't have enough friends to alienate the ones who've stood by you. We get that there was always going to be some legislative fix for DACA. If I were willing to take a cut in pay and prestige to join Congress – and I'm not – I'd vote to deport the whole bunch of them. But that’s not how most people feel. Too many Americans are too soft-hearted. We don't have to like it, but that was always the reality and we have to deal with the situation as it is, not as we want it. As often happens in life, you have got to make the best of what you have, like we did in 2016 when we supported you. But, for some reason, you seem intent on making this bad situation worse. It’s not like you don't have leverage. After all, it's the Democrats, not normal Americans, who need to import a new electorate to replace the uncooperative, racist, sexist, transphobic, and entirely too self-sufficient existing one. If the Dems aren’t willing to deal, okay…and? Oh no, a bunch of future Democrat voters who shouldn’t be here in the first place will have the sadz. How is that our problem? So to roll over and humiliate yourself by not insisting on a real concession by the enemy is just mind-bogglingly stupid. The vague reference to "border security" is the giveaway. To the extent that it exists at all, the next Democrat is just not going to enforce these mystery reforms. Where is E-Verify? Where is the RAISE Act? And where are the changes to the proposed DACA legislation that stops excusing criminal acts by these illegal aliens and that ensures they can't chain migrate their entire tribe in from the crappy Third World hellholes they abandoned? There’s a deal to be made here, and you hold all the cards, Mr. President. Are you going to make it, or are you going to roll over? Because what we saw isn't the art of the deal. This is the art of being suckered.